This week, we are featuring some amazing new specials. Each dish is unique in its own right... add to them a little bit of Chef Chris' ideas, and their flavors really pop! Check out what we are featuring below. You won't want to miss these dishes. You called for it; we obliged. We were not kidding when we said we would honor requests for "old" menu items to make their return. 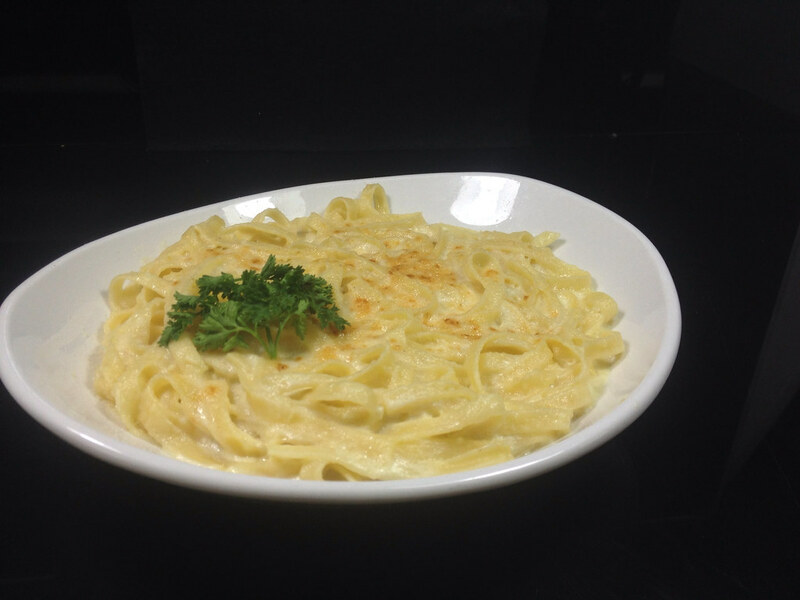 This week, you will see the "original" fettuccine alfredo. We have several people who were devasted when this dish was removed from our menu, including Ryan's daughter Emersyn. (She may have even boycotted us for a few weeks when this happened =) My wife is also a big fan of this dish, and ours in particular. I think she has tried every place in town but has declared ours the best. There is no creamier, tastier sauce with a toasted parmesan crust better than ours. A simple dish, yet there is importance on the creation of this sauce to make it truly unique. Everywhere you dine, you'll see cod... though most places fry it. Here, although it is simply baked, it is what complements the dish that makes it so yummy. Calling all garlic lovers: this dish is for you. We top this 10 ounce broiled cod filet with a beet gremalata. Pronounced "grem-ah-lah-tah", this is an Italian herb condiment that is usually made with garlic, lemon, fresh parsley and olive oil. We have added fresh roasted beets to this plate which pair quite well with the light, flaky cod filet. As promised last week, we have brought the next generation of the fish taco: calamari tacos! Soft flour tortillas are filled with fresh, fried calamari, red cabbage, cilantro, sweety drops, green onions, lime ginger aioli and the kicker..... jalapeno plum sauce. We are in the business of making ordinary food items.....extraordinary; they're something you will not forget. This is why we often find it hard to choose which items stay and which go. Everyone knows about our Oscar Sunday right? Well, here is a bit of a twist. Broiled prawns topped with real lump crab meat, hollandaise and - instead of rice - pearl cous cous. This oscar will only be out for a limited time, so do not lose your chance to enjoy this dish.